It has been my experience and observation you will be judged as a leader, more by how you listen, than how you speak. And yet, workshops with titles similar to “Speak Like a Leader” or “How to Speak with Authority” are very popular and often oversubscribed. It is almost as if, speaking better, differently, or perhaps with more authority, is all that is required for our success as leaders. The subject of listening was one of seven habits described by Stephen R. Covey in his top selling book, 7 Habits of Highly Effective People. The powerful habit he described is: Seek First to Understand, Then to be Understood. Listening to respond (which is what most of us do) is very different than listening to understand, and people know when we are doing one and not the other. I’m fond of saying it this way; “The best parents, spouses and leaders are able to listen to what people say… and hear what they don’t say”. To truly listen to another human being, and to understand, is more than simply hearing the words they say, and worse yet, responding to what we only think they meant without any validation or verification. 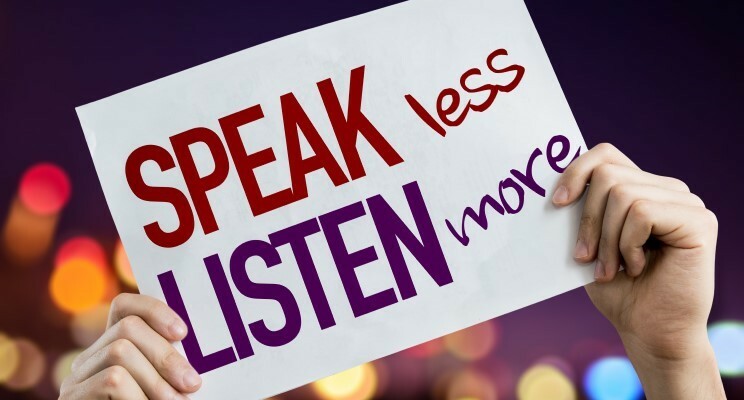 To be great leaders, we must listen more intentionally. We must be fully engaged in another person’s non-verbal cues, tone and the feelings being expressed, or perhaps more importantly, suppressed. Just think for a minute, how many times you have desperately wanted to be completely understood by another human being, and yet felt unheard and deeply hurt or disappointed. There has been a great deal of research done over the past number of years around the subject of employee engagement. We know employee engagement is important to an organization’s level of success. We also know there is a direct correlation between an employee’s level of engagement and how they are managed by their immediate supervisor or manager. Increased understanding between manager and employee yields higher levels of engagement. Understanding requires better listening. Work hard at paying attention to not only what is being said, but also what isn’t said, at least with words. You will find clues by paying attention to an individual’s tone, body language, non-verbal cues and overall demeanor. Beware of making assumptions or jumping to premature conclusions; you’re only seeing the situation from your perspective and there are likely many perspectives. Often, the issue or problem being discussed, isn’t the issue or problem at all; the issue being discussed is merely a symptom of a deeper problem, need, fear or concern. Stephen Covey was correct in writing; “If you want to be understood, seek first to understand.” Try this approach with your teenager, superior, spouse, employee, etc., I predict you will be amazed at the results you get. My last tip; seek feedback about your listening habits from people who know and care deeply about you and your success. I am fortunate to be married to a woman, who lovingly and gently, reminds me on a regular basis that I need continuous work and focus in this area. She knows I mean well, and I know she is right; I am frequently a careless listener. I’m so thankful for her feedback and I worry about all the people who have been negatively impacted by my unintentional poor listening habits. Truly scary for me. How about you? Let’s all strive to be better, more intentional listeners and leaders this week! As always, how will you lead differently, or better, this coming week?